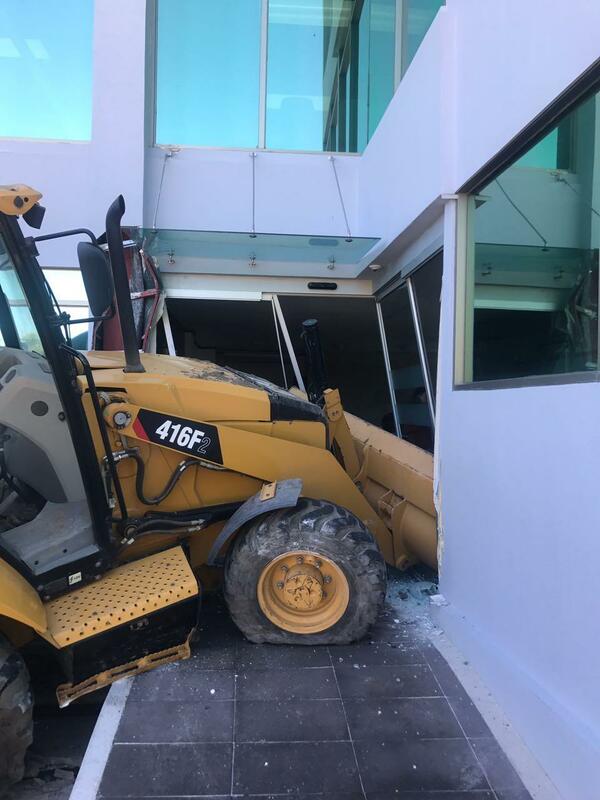 Outraged a man decided to take out his frustrations by plowing a backhoe into the front door of a building and then rolling a small truck when men on behalf of Maquinaria y Tractores Limitada (Matra) – the CAT dealer in Costa Rica – came to repossess two backhoes. 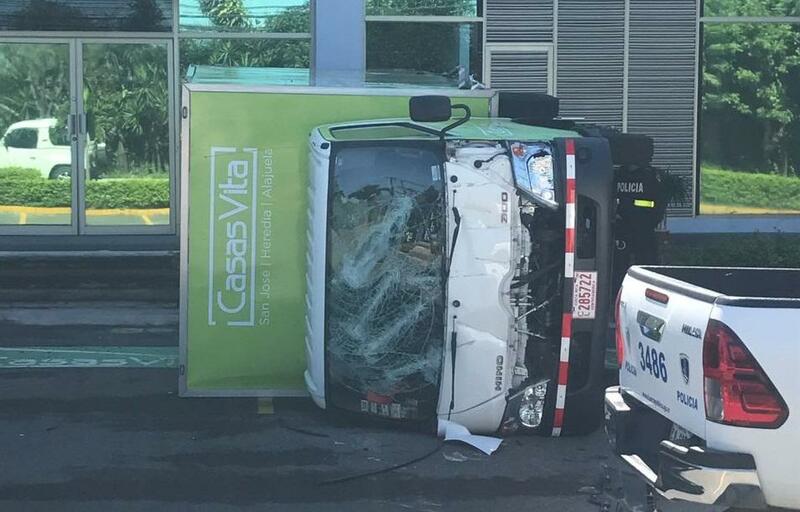 This all occurred around 8:00 am, in Pozos de Santa Ana on Wednesday morning, at the CasasVita construction company, not far from Matra’s dealership. Witnesses, who preferred to remain anonymous, said that after an altercation between the repo men and CasasVita employees, one of them started up one of the backhoes and ran it into the front of the building and then against one of the builder’s trucks parked in front. According to the Fuerza Publica (national police) and Santa Ana Municipal Police, the actions only caused material damage, no one was injured and the person responsible for the outrage left the scene. Maikol Barboza, an official of the Santa Ana police, said the Matra people arrived at CasasVita with a legal document, signed by a judge of the San Jose Judicial Circuit Court, authorizing the repossession of the backhoes. Each backhoe is valued at US$80,000 dollars. For its part, Matra said the person causing the damage did not represent the company. Bernal Moya, Matra’s financial manager, told La Nacion, that backed with the court order the men were there to legally recover the equipment that had been purchased on credit and that the builder had provided a guarantee for. Moya added that, upon learning of the repossession, the individual got upset and rammed the backhoe against the truck and building. The Matra official was adamant the individuals executing the repossession are not Matra employees, rather hired by lawyers to recover the equipment. In the end, the repo men got their equipment and CasasVita was left with damages that it can now sue for. As of last night, the press office of the Organismo de Investigación Judicial (OIJ) and the Fiscalía (Prosecutor’s office) said they had not received any complaint from the company that suffered the damages. According to the Fiscalia, CasasVita has been investigated on several occasions for fraud. The Fiscalia said the most recent case was in July against a man surnamed Villagra, representative of CasasVita, for the alleged crime of fraud to the detriment of three people. That case is in the ‘preparatory stage of investigation’, a process that consists of collecting and analyzing evidence, according to the rules of procedure. In addition, the Fiscalía del II Circuito Judicial de San José filed another case against Villagra on April 27, 2016. That case, also for fraud, was dropped after builder reached an agreement with the affected. CasasVita has not responded to calls for comment.